Let’s be honest here. We all know that the Sales team is the guts and glory of the business. They’re the ones going in on the front lines, doing the dirty work, negotiating, and winning the battle. They get all the honors after the deal has closed. But what about the Marketing team? If the Sales team is the brute force, the ones that carry out the mission, Marketing is their secret weapon. Marketing creates the tools Sales needs to get the job done. Under the content marketing umbrella, there are 6 secret weapons that promote LeadGen and lead nurturing efforts. We call these the Sales Team 6. Marketing deserves a little bit more credit than they typically receive. Content creation takes time, research, strategy, and a good deal of creativity to do it right. The goal? To attract, engage, educate, and excite prospects to convert them to Marketing Qualified Leads (MQLs) and pass along to Sales. Each of the 6 tools of content marketing can be used in various stages throughout the decision making process. We will go more in-depth with each of these below. It’s hard for some business professionals to realize the huge leadgen potential that blogs carry. Blogs sometimes get a bad rep as a non-serious, unprofessional outlet for amateur writers. We hate to admit that sometimes that’s true. But not for B2B companies that are looking to gain exposure and engage with their audience, i.e. their target prospects. In fact, according to HubSpot, B2B companies that blog get 67% more leads per month than those that don’t. Through the inbound marketing lens, blogging works to attract, educate, and engage prospects. Blogs bring in inbound leads to your site based on keyword search. Your prospects search Google for pain points and challenges that they have, and over time, your blog that addresses a specific challenge may come up as a result. Inbound marketing is a marathon, not a sprint. Marketers are constantly producing content to be distributed through various channels. Over time, that content works to build an online presence that increases the chances of it getting found. We recommend blogging 2-4 times a week (or more if possible) to build up a strong content library. For Sales: Aside from a LeadGen tool, blogs serve to educate and engage with prospects. For a sales rep that is in contact with a prospect, a blog on a specific pain point might be a useful resource to offer. Blogs are typically considered Top of the Funnel (TOFU) content assets, because they attract visitors to your site. But Sales can leverage specific blog articles throughout the buying process to further the prospect’s engagement. Take a look at the content marketing funnel to see where each content type fits into the sales process. Twitter, LinkedIn, Facebook, Google+. The big four of social media. For B2B companies, Twitter and LinkedIn are essential to your social media strategy. They are more than tools that share what you ate today or what movie you just saw. And they involve more strategy than you may think. Getting in front of the right people on Twitter or LinkedIn is a time-consuming process that takes strategy and research. Marketing works to uncover where the target prospects are hanging out. On LinkedIn, they look at what Groups their prospects are members of and try to interact with them there. On Twitter, they may look at Twitter Chats they’re involved in, or follow various hashtags related to the industry. For Sales: Sales should also be on social media. Twitter isn’t just for Marketing. It helps build your company and personal brand and it is easier to reach out to new prospects if you have a social presence that demonstrates your knowledge and expertise of the industry. Videos, especially explainer videos, are excellent TOFU content offers. It’s amazing how much information can be conveyed in a short 30-60 second video. And because the attention span of an average web user is only 6 seconds, what better way to capture your prospect’s attention? Explainer videos give a very broad overview of what your company does. They address key pain points that your prospects might have. They are meant for prospects that are just discovering a need for a solution to their problems, which is why it is a TOFU offer. Videos can be used throughout the sales process however. 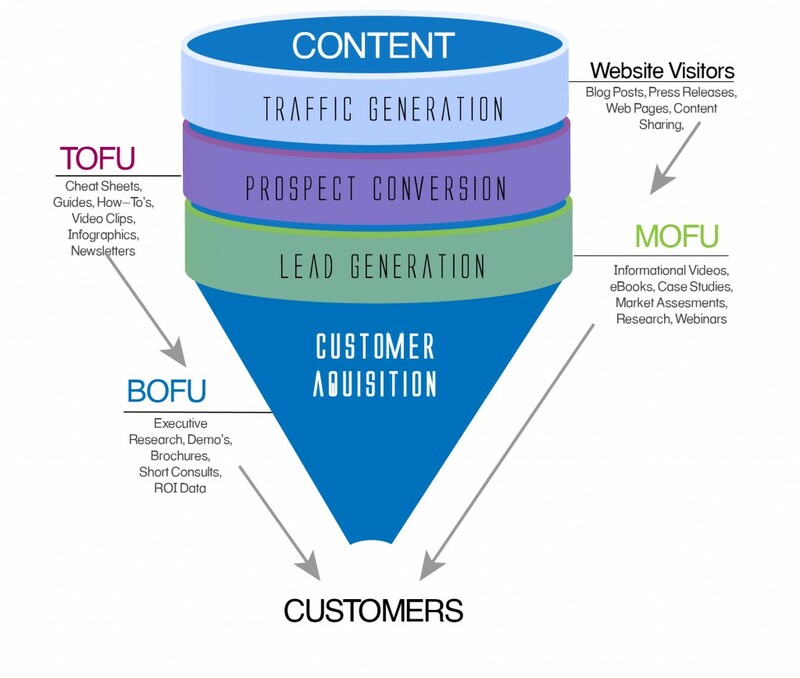 A “How To” or “See It In Action” video might be a good middle of the funnel (MOFU) offer, while a “Testimonial” or “Proposal Process” video would be a good bottom of the funnel (BOFU) offer. For Sales: Present a new prospect with an explainer video. This serves as an ice breaker and opens the sales conversation. An excellent way to generate sales leads and move them further through the decision making process is by guiding them to relevant eBooks. These content assets are mostly MOFU offers that address problems and challenges and offer solutions. For example, the eBook “The Key To Collecting Patient Payments” would be valuable for the healthcare provider that is looking for a solution that will help them reduce debt and increase revenue. Sales can leverage eBooks that are educational and informative throughout the sales process. The key is to know exactly what content will address your prospect’s specific challenges and provide them with valuable insights. For Sales: Understand what eBooks you have in your arsenal. Work closely with Marketing to understand how these can be used throughout different stages of the decision making process. An excellent way to provide a prospect with more information is through a more detailed White Paper. A White Paper, like an eBook, is a more researched content offer that presents problems and their solutions. It could also serve as an objective, report-style piece—like a “State of Inbound Marketing Report”. White Papers are mostly MOFU offers, because of the depth of research and information involved in their creation. For Sales: Show your prospects your expertise—leverage a White Paper that is researched and informative. This shows you have done your homework and you know the solutions that your prospects need. Having a pulse on your prospect’s industry is a good indicator you know what you’re talking about and are actively engaged in their business. Once you’ve made it through the funnel and offered various content offers along the way, the last stop is a Case Study. A Case Study can be a MOFU-BOFU offer, but we typically recommend presenting it last, after you have qualified that the prospect is sales-ready. A Case Study shows the success another client had with your business. For that reason, it is purely a sales talk offer. Someone who has just visited your website and downloaded an eBook or White Paper on “The State of the Healthcare Payment Industry” is probably not looking for a Case Study just yet. They are in the infancy of engagement. For Sales: It is Sales’ job to know when to deploy this secret weapon. And skilled sales reps do. When a prospect is nearing the end of the decision making process, a Case Study could seal the deal. Download the “30 LeadGen Tips” Guide to learn even more about LeadGen efforts and collaboration between Sales and Marketing. Click below to get started.